Another one with my colleague! and now... Let's Do IT!! There goes the Loe Hei for everyone! Till the next year... Happy Days ahead! Did u say cornflakes?? I've never eaten one with that. Interesting idea! 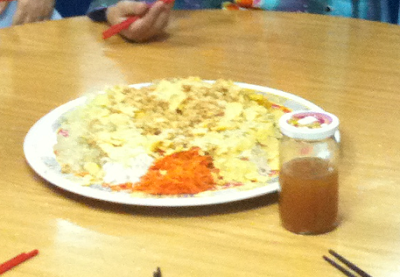 cornflakes is not a bad idea..maybe I should try to prepare my own lou sang next year. Wah!!! Office also party! Here's to a great year ahead!!! Cheers! eh yellow thing is what ah? wah so harmony... irregardless of race..
A very beautiful yee sang, with beautiful ladies. yes, CNy is over but a new year started. have a great year ahead! So colourful yee sang you have there. Always love your trade mark, the peace sign. May the year ahead be as colourful as the yee sang. sk: aiyah..then u should come IPOH then I can take you for Loe Sang! mecoy: yes, all types of shredded vegetable..
stp: Cheers to you too!! Happy Blogging!! sharon: yeah, i agree, she is pretty good..
medie: yeah.. i love that too! andrew: same to you!! God Bless! irene: yes, i love that combination of colours too! Have a great year! I think I lou sang almost 9 times and surrendered! I agree that cornflakes is a brilliant idea and it sparked my eyes up!! I enjoy the togetherness when tossing the food. I would scream Huat Aarrrrr!!! Own made Yee Sang, your colleague very pandai.